Lord’s Prayer Lesson #1 – What is Prayer? This free Bible lesson is part 1 of 10 in our Lord’s Prayer study. It starts with a basic definition of prayer before dealing with the specifics of Jesus’ model prayer. We welcome your ideas and suggestions to improve this lesson for other readers – simply leave a comment below. 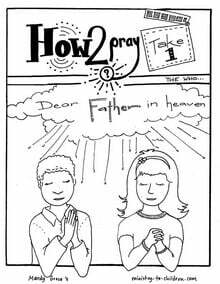 Lesson One: What is Prayer? Main idea: Prayer is talking to God the Father, through Jesus Christ the Son, by the power of the Holy Spirit. Spend time in prayer. Pray for your students. Gather: Bible, chart paper and markers or dry erase board and markers, 2 paper or plastic cups per child, 10 feet of cotton string per child, markers and stickers. Game: Play a good old fashioned round of telephone. Have all the kids sit in a circle. The first player thinks of a phrase and whispers it into their neighbor’s ear. This player then whispers what they heard into the next person’s ear and so forth, until everyone has heard the phrase. The last person to have something whispered into their ear, (the one right before the first player) says out loud to the group what they heard, and the first player says the original phrase. You will find, in all likelihood, that the phrase changed. Play a few rounds. For a variation, play music in the background, so it is harder to hear what is being whispered. (You can then reinforce the idea that God never shouts at us, but whispers, and we have to listen close through all the other noise in life.) You may consider writing phrases on slips of paper, as coming up with what to say can sometimes be the trickiest part of the game. Encourage the kids (especially older ones) to repeat the phrase they hear faithfully, without intentionally changing things. Ensure them the phrases will still be funny in the end. Say, Today we are starting a new series. We are going to study the Lord’s prayer. The Lord’s prayer is what we call the prayer that Jesus taught his disciples when they asked him to teach them how to pray. Before we learn about that prayer, first we need to discuss, what IS prayer? What does it mean to pray? Prayer is talking to God the Father, through Jesus Christ the Son, by the power of the Holy Spirit. Now I know that’s quite a mouthful, but we’re going to spend the rest of class discussing what that means. Let’s start by talking about that game we played. Why would we start a lesson on prayer by playing a game of telephone? When we played this game, one person said something, and by the time it got around to the last person, most of the phrases had changed. Does this happen when we talk to God? NO! When we talk to God, we don’t have to talk to a bunch of people in between, and what we say NEVER gets mixed up or garbled. The Bible says; “You know what I am going to say even before I say it, Lord” (Psalm 139:4). God knows what we are going to say even before we say it! Isn’t it great to know that God knows our every thought? (If you have a dry erase board or chart paper, draw a small circle near the top and label it “God the Father.”) God is like a father who takes good care of his kids. Good fathers know what their kids need and gives it to them. God is the perfect father. It says in Luke 11:13, “So if you sinful people know how to give good gifts to your children, how much more will your heavenly Father give the Holy Spirit to those who ask him.” (Draw a small circle near the bottom left of your board and label it “Holy Spirit.” Draw a line from the God circle to the Holy Spirit circle.) According to Romans 8:26, “The Holy Spirit helps us in our weakness. For example, we don’t know what God wants us to pray for. But the Holy Spirit prays for us with groaning that cannot be expressed in words.” What a wonderful Holy Father we have! God the Father gives us the Holy Spirit so we can pray for hard things, even when we don’t know what words to use. The last part of our triangle of prayer is Jesus Christ. (Add a small circle near the bottom right of your board and label it “Jesus Christ.” Draw lines from this circle to the other two circles.) Jesus is the one who makes it possible for us to talk to God. You see, God is perfectly perfect. He is so perfect and so good, he cannot be in the presence of sin. We are all sinners. Without Jesus dying for our sins, we can’t stand before God in prayer. We need the blood of Jesus to wash away our sins so we can stand perfectly forgiven of our sins before God. So prayer is talking to God the Father, through Jesus Christ the Son, by the power of the Holy Spirit. Craft: Make string telephones. Have the children each decorate two paper or plastic cups using markers and stickers. Poke a hole through the bottom of each cup, right through the center. Thread the string through the bottom of the cup and tie a knot in the end of the string that is inside the cup. (You could also tie a paperclip to the string inside the cup to ensure it does not get pulled through.) Thread the other end of the string through the bottom of the other cup and tie a knot in the end of the string that is inside the cup, or add a paperclip. Hand a friend one end of the completed telephone and stand far enough apart for the string to become taught. Quietly talk into the cup while your friend holds the other end up to his ear. Take turns talking and listening. Tell the kids, with a string phone, we can talk directly to our friends without anything getting in the way. We can talk directly to God without anyone or anything getting in the way too. One of our teachers, Shannon, had a great analogy for the Father – Son – Holy Spirit relationship in prayer: It’s like God the Father is talking to us through a walkie talkie. He has one handset. Jesus handed us the other handset when he died on the cross – we have a way to talk directly to God. (Demonstrate with two walkie talkies, but the one you give the kid (through Jesus) should be missing its battery.) What is missing? The Holy Spirit provides the battery, the power, that we need when we talk to God. Pray is talking to God the Father, through Jesus, by the power of the Holy Spirit. Tony Kummer (Editor) reviewed & updated this page on : December 8, 2013 at 9:48 pm. All our content is peer reviewed by our readers, simply leave a comment on any post suggest an update.